One of my best friends from high school, Brian, lives and works in Manhattan. He invited us to come by and tour where he works. It’s just a little company by the name of “Google”. 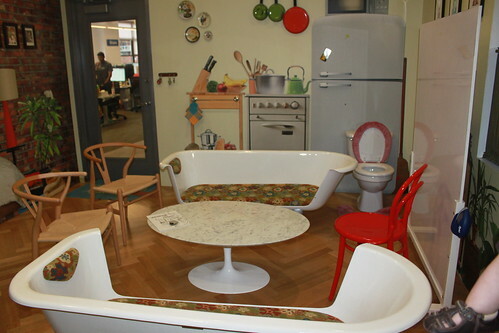 So on our second full day in New York City, we found ourselves immersed in a most impressive work environment. I had somewhat expected to get off the subway and see this giant towering skyscraper with the familiar Google logo on top. The building itself was surprisingly short, but it takes up a whole city block! It has the second largest footprint in New York City and takes nine minutes to walk around the perimeter. 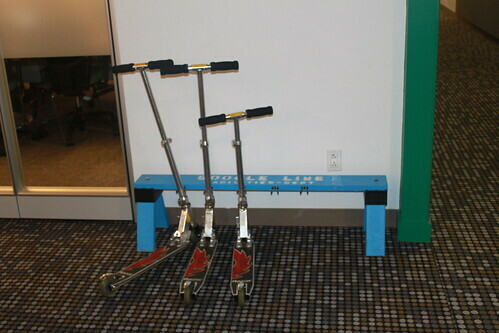 Inside a series of maps helps employees and guests navigate the vast offices and a number of scooters (and scooter parking areas) are scattered throughout to assist with transit. There are also a couple of ladders to give employees a more direct route between floors. A lot of thought went into the art and decor of the offices. 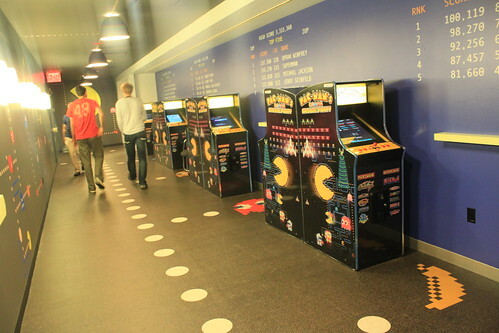 Each floor, each conference room and each “mini” kitchen had a theme– they had a Pac Man mini kitchen, a conference room with bathroom-themed furniture, a jungle room. 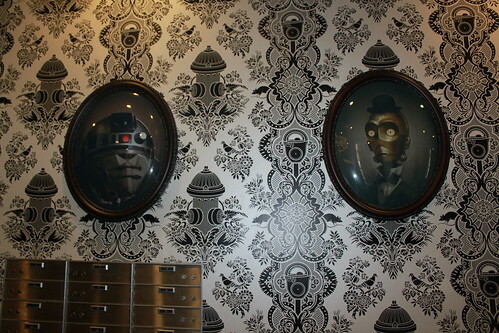 A lot of artwork was particularly appealing to geek culture– portraits of Star Wars characters and even an xkcd mural in the stairwell. Google feeds their employees well. In additional to ample “mini” kitchens, there were a couple of cafes where the employees and their guests can partake in free meals. It’s good food too! Our visit was timed so that Brian was able to take us to the “small” cafe to eat. Sagan got to try quinoa for the first time along with the more familiar cantaloupe, strawberries, chicken, swiss chard, mozzarella and bread. The cafe we were at had a Manhattan Cityscape painted on the walls and an actual water tower that was relocated and rebuilt inside the cafe. We’re told if you stand in the right spot, the painted buildings line up with the actual buildings outside. 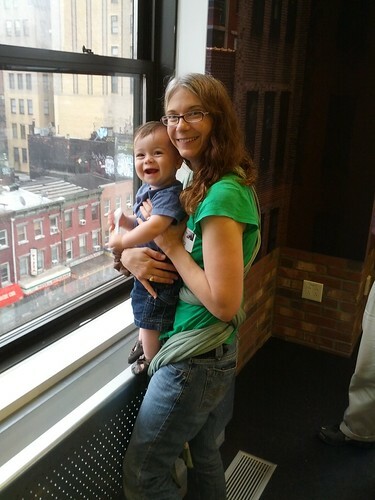 Sagan very much enjoyed taking in the view and banging on the window. The library was quite impressive. 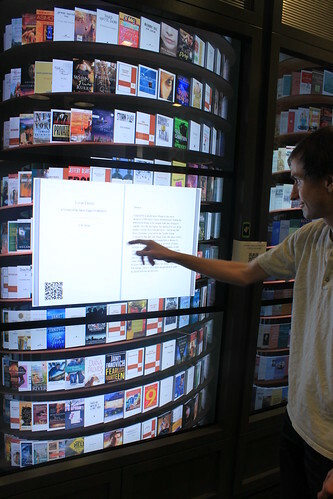 One wall was covered in touch screens where you could browse through bookshelves and open up and preview books. The opposite wall of the library was lined with more traditional bookshelves and books, but even that had a twist. One of the bookshelves was actually a door to a hidden work room with a nice, inviting lounge chair. Google was a great place for “an unabashed nerd” like Ryan to visit. They had a display of old computers and video game consoles which appealed to Ryan’s habit of cataloguing museums with Creative Commons photos on Flickr. There was a community chess game going on and we met an employee who had organized a Human Turing machine (which was reminiscent of the Human Bubble Sort Ryan organized with the Neighborhood Kids). One wall sported a safe. 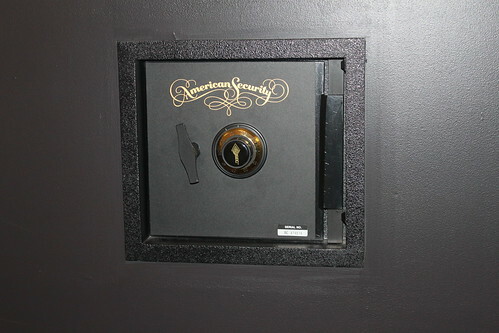 Supposedly throughout the building there are clues to opening that safe! 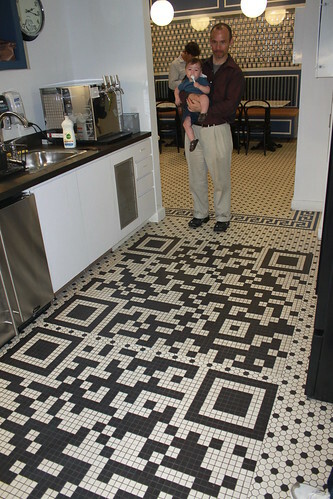 Perhaps we saw one of those clues– QR Codes in the tiling of one of the “mini” kitchens. 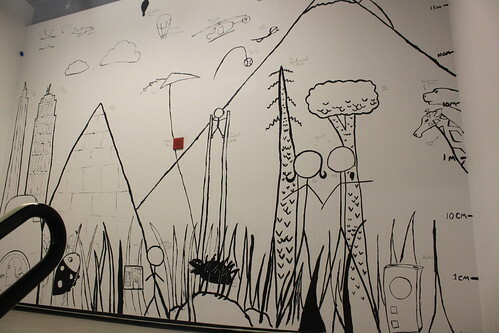 A lot of walls doubled as white boards and housed formulas, notes, pseudo code or simply links to someone’s YouTube page. QR Code Tiles – Possible Clue? Google was a great place for someone nature-oriented like me to visit as well. 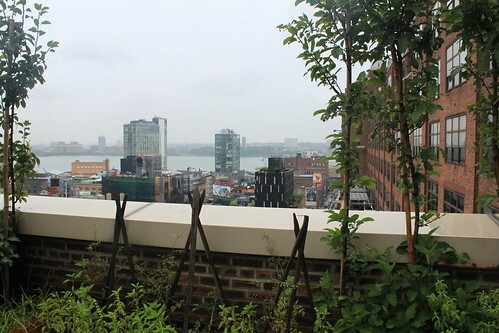 In addition to everything mentioned so far, the offices had outdoor terraces…growing edible plants! Google is Great for Babies!!! Now, perhaps it is obvious that Ryan and I would enjoy a visit to Google. 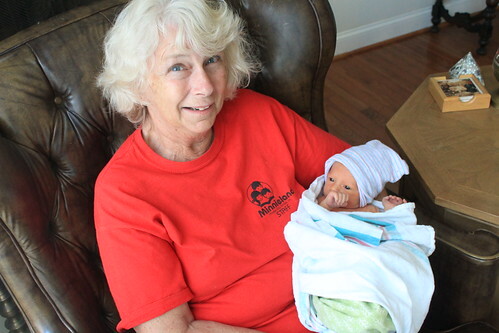 Get this– Google was also a great place for a baby!!! 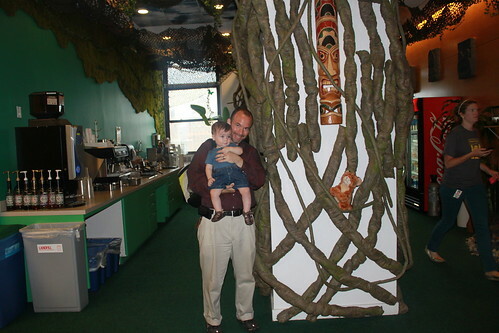 Not only were there a lot of finger foods to try, there were lots of stimulating art and colors for Sagan to look at. There were super friendly employees to smile at and large areas great for walking practice. At one point, Brian was showing us an “Explore Your World” center powered by Google Earth and a semi-circle of flat screens. While Brian was exploring his world, Sagan was exploring his, inch worming across the carpet, taking in the patterns. 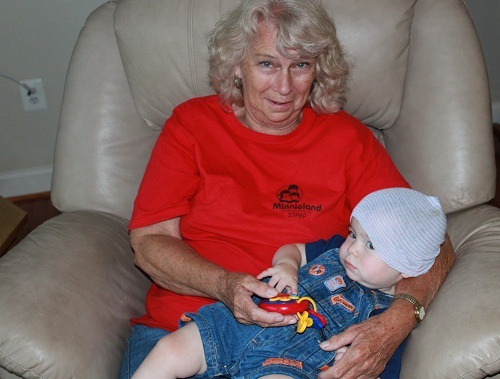 Finally– there was a ball pit and stuffed animals. 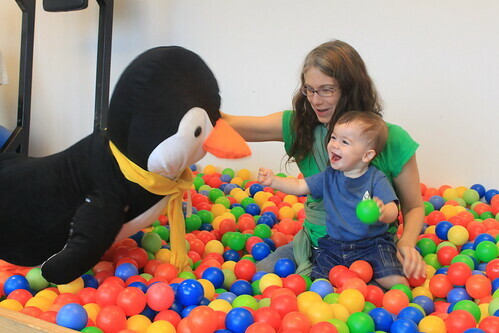 Initially Sagan was scared of the ball pit, but he warmed up to and had an absolute blast! There were some more subtle perks as well that come along with working for a large company like Google. While we talked, Brian revealed that he does not have to work 80 hour weeks as rumor would lead you to believe. Furthermore, he isn’t on call 24 hours a day like Ryan and I are. And unbelievably, Brian can actually leave his laptop (and work) behind at the office– a luxury that is hard for me to fathom! Thanks Brian For a Great Day! 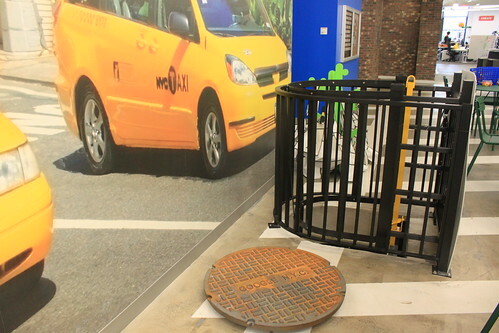 More pictures of the Google Manhattan Campus are on my Flickr site. Sometime in the last week, this blog passed 900,000 views. Next up, 1 million! Back at Rachelle and Thad’s Sagan took a nap. When he woke up, the adults fueled up on some peanut butter toast and then headed out for adventure. 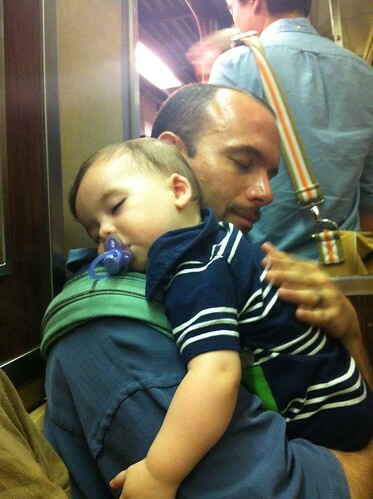 On the subway, I made the realization that I had forgotten to pack diapies…. and Sagan was sort of due for a “BM”. So when we arrived at Central Park, we first did a quick lap of the area to procure some diapies and wipes. It turned out they weren’t necessary, but this was definitely a “Better Safe Than Sorry” moment. 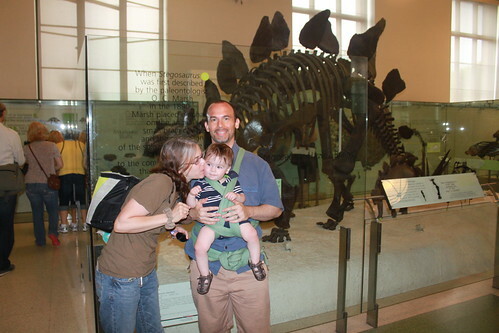 At the museum, we first went to go see the Big Bang movie. We were surprised to hear Liam Nesson’s voice instead of Maya Angelou. The movie had been redone. Sagan did watch the happenings on the floor, but also found the time and inclination to kick the railing and to shove his hand into Aunt Rachelle’s mouth. After that, we went to the Creatures of Light Nature’s Bioluminescence special exhibit. This was well geared for Sagan as there were a lot of blinking lights. He particularly like pressing the green button to communicate with female fireflies and he loved walking in the pretend water (lights projected on the floor) of the Bioluminescent Bay of Vieques Island section. He did have “fussypants” moments- when I wouldn’t let him pull down a display, when I didn’t let him put a pacifier he purposefully threw on the ground back in his mouth and when we had to put things back on the shelf at the gift shop. But overall, I would say his demeanor was happy and enthralled. 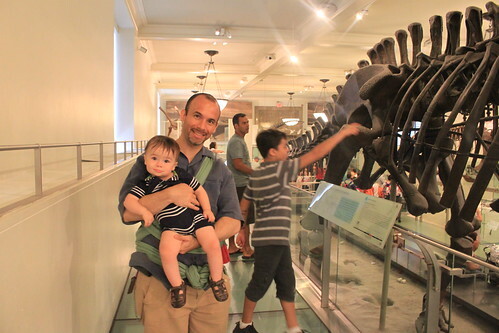 After Bioluminescence, we had to hit up some dinosaurs. Sagan actually was wearing a little Stegosaurus on his outfit, though you can’t see it due to the ever-awesome and handy Moby Wrap. We also stopped by the Hall of Human Origins where Sagan shook hands with some of his ancient ancestors. I was also surprised how small Australopithecus was. They were almost Sagan sized! Well Hello! Glad to Meet You! 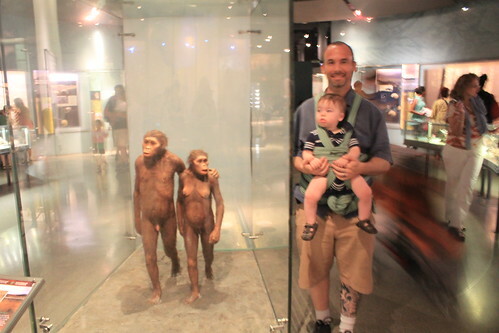 It’s Blurry, but Look How Small Australopithecus Is! 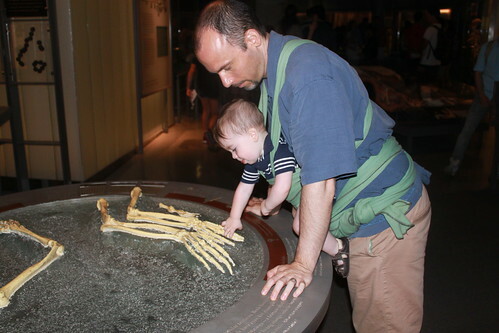 The American Museum of Natural History is always educational, so it isn’t surprising Sagan learned some new skills. 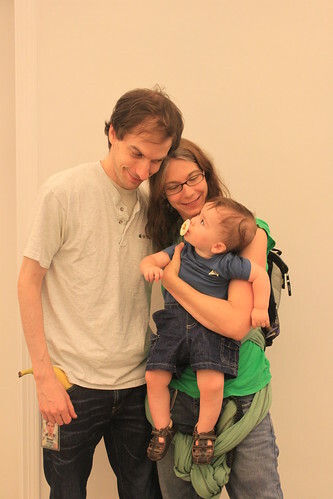 Early on, Sagan discovered his echo in the museum hallways. 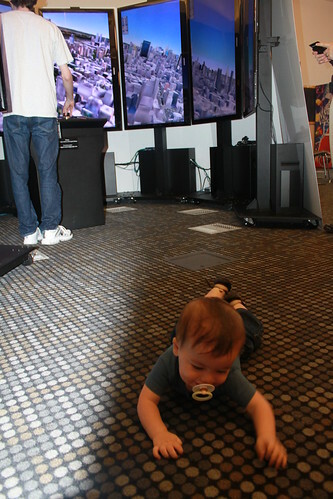 From that point on, whenever we were navigating between exhibits, Sagan marvelled in shouting and hearing himself reply. 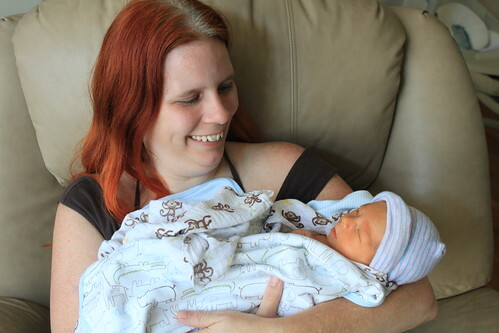 Aunt Rachelle, however, taught him a more valuable life skill. 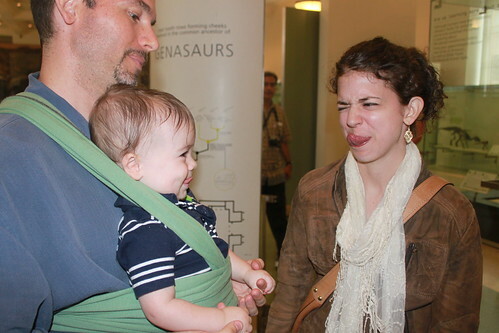 By the time we left the museum, we had one tired baby. But we were graciously spared a spectacle on the subway. A number of strangers smiled and made faces with Sagan which kept him happy and entertained until he finally fell asleep. After his first Ethiopian food, young Sagan fell right asleep. It was a wonderful, albeit busy day. More pictures of our visit to New York City are on my Flickr site. Sagan celebrated his first birthday last week! 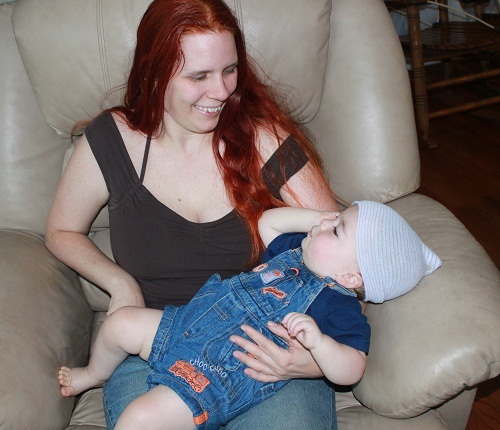 In addition to the other festivities, we put the same hat on him that he was given in the hospital and did a quick reenactment on some photos from his first week. Enjoy!